This was the first project that I shared on my blog, back in 2011. 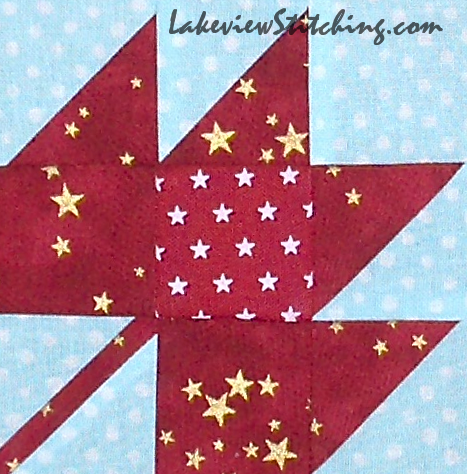 I am amused to see that I also thought it would be my first quilt finish! One of the best things about blogging is that we can look back and see how we ourselves have changed over time. 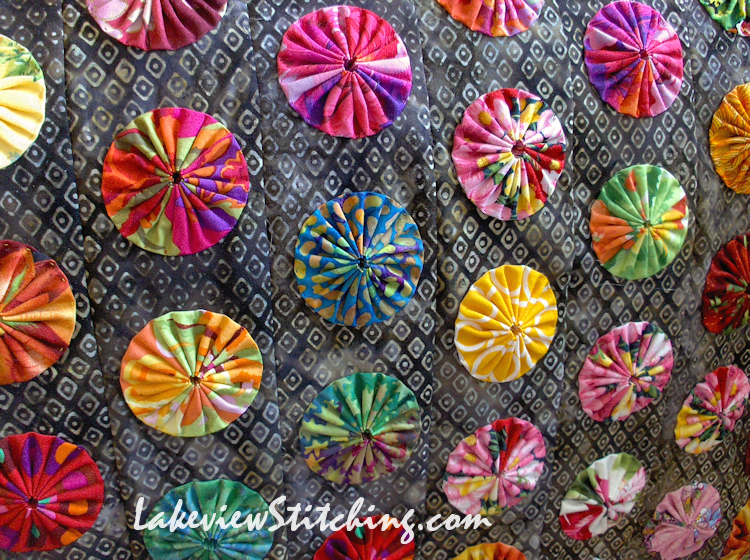 It was a lot of fun to make the yoyos, and it was even pretty fun to applique them all to the batik strips. But, sewing those strips together with all the lumpy yoyos is quite a stinker, and I was completely stumped about how to quilt the big bulky thing. I think it may be the most impractical quilt ever! How will I wash it? But the instructions are excellent -- the designer Terry Atkinson must have spent days doing math to get the yoyos all spaced so evenly. So that is a good fit for Pi Day! And as it comes together, I can see that it will be gorgeous, even if it only spends its time folded on the edge of a couch somewhere. I'm halfway, and I've decided that two rows a day will be manageable. Right now, though, I am putting the borders on Allietare. And it's looking good too! After I sewed the last seams and spread the centre out on the bed, I got out the tape measure. The moment of truth! The length and width of this square quilt were exactly the same, so that is the quilting equivalent of a "drop the mike" moment. I immediately put the tape measure away again! 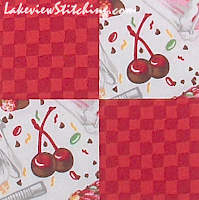 And hey, aren't these cherries a good fit for Pi Day? They are one of the easier blocks in the 150 Canadian Women quilt along, in honour of Canada's 150th birthday in 2017. 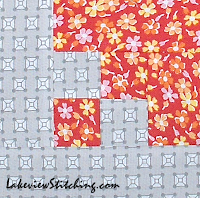 I've been relaxed about this project, because so far it's been easy to sew two weeks' worth of blocks in one sitting. But I've noticed that the blocks are getting harder! So I want to get a little more caught up. I've really been enjoying this project, and learning so much about significant women in Canadian history, who were never mentioned when I took history in school. This maple leaf, with the light sky blue background and two kinds of stars, is for Roberta Bondar, the first Canadian woman in space. 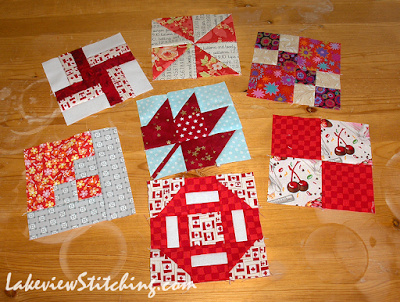 Mostly I am sticking to the red & white colour scheme of the quilt, with just a few exceptions. 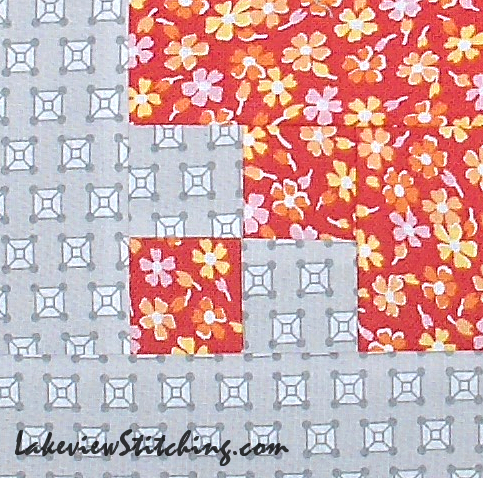 These light grey and red floral fabrics just happened to be piled together in the cupboard. I liked how they looked, so now they are together in a block! Another beauty gets to see the light of day again. I love your yoyo quilt. It looks like an array of colourful little Japanese parasols. Very pretty. 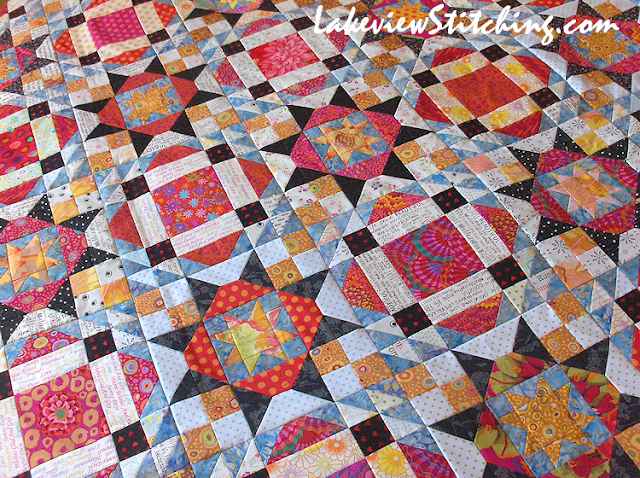 But I do see your qualms about the quilting. 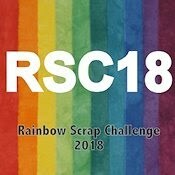 It will present an interesting challenge. Allietare is coming together beautifully as is your Canadian women quilt. It still tempts me every time I see yours, but I really don't know how I would make the time. I'll enjoy your progress instead. I love that Yo-yo quilt. What a good post for Pi day. This math teacher likes it. 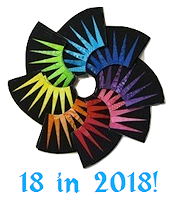 I loved all your pictures of pretty quilt projects. Allietare is gorgeous. Allietare is looking good. And the yoyo's and cherry red color do make you think of pies. 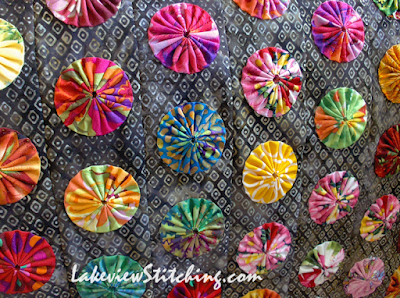 I have such fond memories of a family yoyo quilt but can see this method would make it harder to use. You Allietare is always a joy to see. 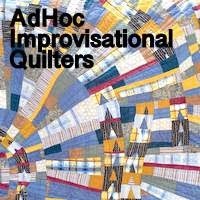 Your yo yo quilt looks so interesting! I don't think I have seen one like that before. I mean that in a good way! Love your Allietare! So close to a finish. What a unique way to use yo-yos! What a cool layout and plan! Yes to pi day! Those cherries did remind me about pie. My great grandmother use to make my dad a cherry pie every year for his birthday. Every year, he would share it with us. We, the kids, thought it was the best birthday gift EVER! How wonderful that Allietare measured equally square!!!!! Yes, see the problems with the yoyos - they do look lovely though and finishing it will give you a real buzz. I love the Roberta Bondar square- the dark red is lovely. Allietare is looking stunning! The prolonged Winter is serving you well! Yes, it's a mixed bag, this winter! 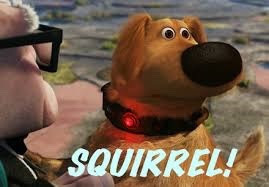 The wind shook the house all night, and this morning the newspaper was in the backyard, but I still don't think I'm ready for allergy season! Anyway, I'll just keep my head down, and keep sewing! Oh how I love those yo-yos! Oh wow Monica, love the yo-yos, Your Allietare quilt looks amazing too. we down under are coming into winter, so nice to have some cooler weather. I hadn't seen your yo-yos before and like them a lot, though I wouldn't want to be the one quilting them. 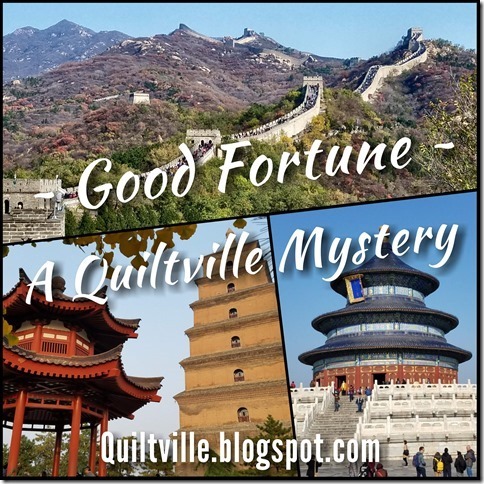 Can you quilt in straight lines between the columns? Allietare looks better every time I see it; just makes me smile it's so lovely.